It's the day after Apple's iPad 2 announcement, and by now you know the new device has two cameras and is thinner faster and lighter than the original. But are you ready for Friday, March 11, when the iPad 2 will go on sale? Apple's original iPad drew big crowds during its U.S. and international launches, and the iPad 2 promises more of the same. With that in mind, here's a quick look at some of things you need to know before braving the crowds next Friday. Apple's second-generation iPad features a 1GHz A5 dual-core processor, front- and rear-facing cameras, up to 1080p video out support via HDMI, a 9.7-inch screen with 1024-by-768 resolution, 10 hours of battery life, an accelerometer and three-axis gyroscope, and separate GSM (AT&T) and CDMA (Verizon) 3G connectivity options. Apple is not accepting preorders for the iPad 2, probably because the new tablet is set for release in just over a week on Friday, March 11. If you're hoping to get an iPad 2 on launch day, expect to be standing in long lines at the Apple Store. The iPad 2 launches at 5 p.m. local time on March 11. Even though you may have to stand in line to get an iPad 2, you may have better luck getting your hands on the new tablet at third-party retailers. Best Buy's website says it will have the iPad 2 on March 11, and a tipster told 9-to-5 Mac that the iPad 2 has been added to the inventory systems for Sam's Club and Wal-Mart. It's not clear whether the 3G iPad 2 models will be available at Verizon and AT&T retail stores on March 11 as well. So far, Apple has only said the iPad 2 will be available at apple.com, Apple retail stores and "select Apple Authorized Resellers." 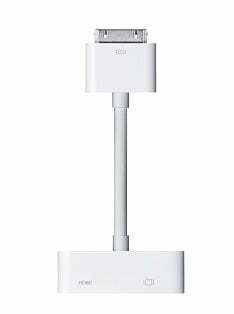 Apple's Digital AV Adapter with an HDMI out port and Apple 30-pin connector doesn't just work with the iPad 2, but also the original iPad, iPhone 4 and fourth-generation iPod Touch. The bad news is only the iPad 2 can support 1080p video out, the other devices only support up to 720p high definition resolution. Movies play at 720p for all devices including the iPad 2, according to Apple. The mirroring effect where you can view the iPad 2's display on an HDTV and the tablet itself at the same time is also only available on Apple's new device. The mirroring feature allows you to easily display and control PowerPoint-style presentations using the iPad 2. It's not clear what kind of HDMI out functionality you will have on the original iPad and other iOS devices. The Digital AV Adapter sells for $40 and will be available soon. If you've had your eye on the iPad, but were reluctant to fork over $500 for the device, then now's your chance to get Apple's first-generation tablet. You can get the original iPad models for $100 off right now in Apple's clearance section. You can grab the 16GB Wi-Fi only iPad for $400 or the 32GB version for $500, and the 16GB Wi-Fi + 3G iPad is $530. If you want an iPad 2 with 3G connectivity, you're going to have to choose between a GSM device on AT&T or a CDMA tablet on Verizon. The iPad 2 does not have dual-mode functionality.